Merchants doing at least $4,100 a month in gross deposits are eligible for funding on a 12-month term with weekly ACH debit payments, a new funder revealed. 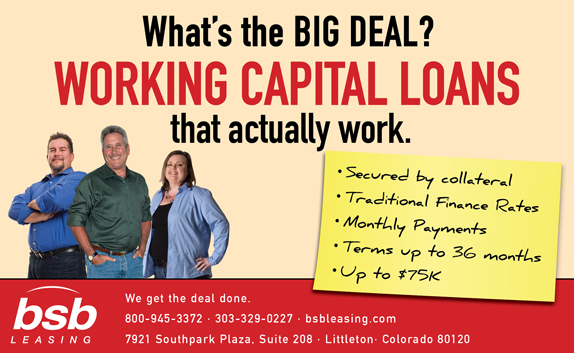 Interest rates start as low as 13.99% but the max funding size is only $35,000. 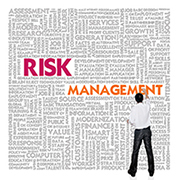 Underwriting decisions can be made instantly online with funds available the next day. “We consider your existing business checking history — not just your credit score,” they advertise. The name of the funder? Wells Fargo Bank. The caveat is that applicants must have banked with Wells Fargo for at least 1 year to be eligible. The upside is that little documentation is required to apply outside of the application. The loan is unsecured and the closing fee is only $195. 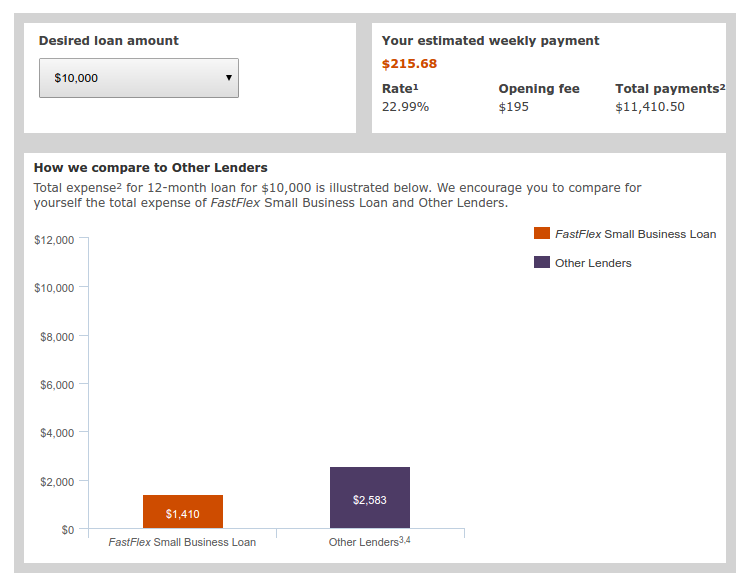 Dubbed FastFlex, the product is clearly meant to compete against online business lenders because well, they mention CAN Capital, OnDeck, and Kabbage in the footnotes on their loan calculator page. Using their loan calculator, Wells Fargo estimated a $10k loan on a 1.14 factor over twelve months with weekly ACH payments. Wells Fargo is not alone in their attempts to attack online lenders. Discover Bank for example, is targeting Lending Club directly. By going after the same borrower profile and offering better terms, Discover hopes to cut into Lending Club’s newfound market share. Unsurprisingly, it is the non-bank prime lenders that will feel the growing bank threat the most. 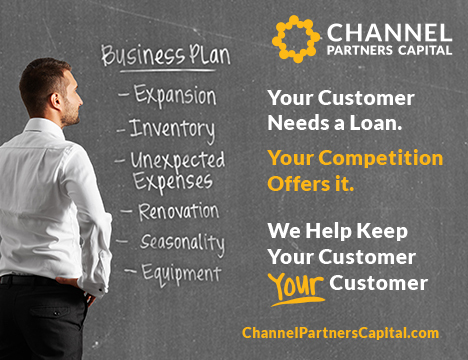 Companies offering small business loans or merchant cash advances to small businesses with damaged credit or complex situations are unlikely to find their target customer pool become bankable any time soon. 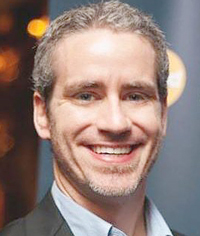 Sean Murray is the founder of deBanked, a 10-year veteran of the merchant cash advance industry, a casual Lending Club and Prosper investor, the co-founder of Daily Funder, an alternative lending speaker, consultant, writer, and enthusiast. 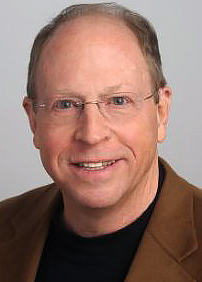 Connect with me on LinkedIn or follow me on twitter. These companies specialize in "C" and "D" credits, often new businesses, or businesses where the principal(s) have Beacon scores around 600 or have had previous difficulties; meaning to become comfortable with the credit and financial statements. That means you need to learn the "story" to make a positive decision, often requiring further security, shorter term, or additional guarantors. Many of these companies may also have programs for “A” and “B” rated companies, but their specialty is not being a “cookie cutter” and often require full financial statements and tax returns as well as a “story about the company, its history, goals, circumstances” to fully understand the full financial picture. 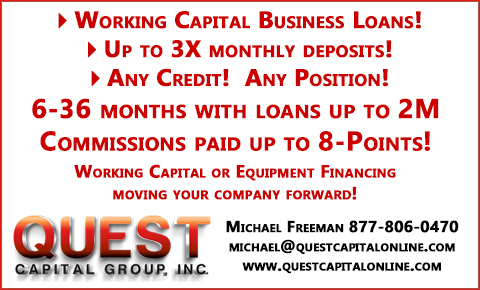 Many of these companies also offer business loans and working capital loans, as well as doing "subprime leases." 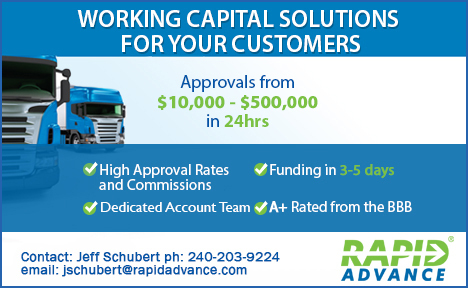 All accept qualified third party originations and pay a commission. 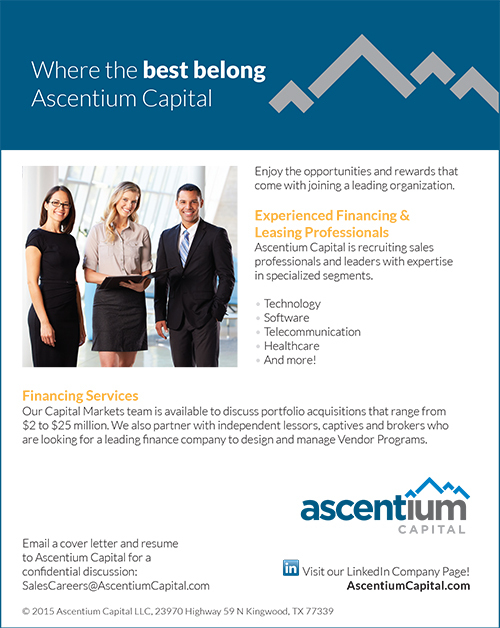 To qualify for this list, the company must be a funder (as qualified by Leasing News and on the “Funder List” and not a "Broker/Lessor” along with an acceptable Better Business Bureau Rating and no history of complaints at Leasing News, as well as notifying lessees in advance when the lease will end and what the residual will be, specifically not automating extra lease payments, as we as insisting their discounter follow the same policy. We reserve the right to not list a company who does not meet these qualifications. We encourage companies who are listed to contact us for any change or addition they would like to make. Adding further information as an "attachment" or clarification of what they have to offer would be helpful to readers is also very much encouraged. Recruiters International Inc.’s (RII) mission has always been to build long-term relationships with clients AND candidates in assisting in their career endeavors. We have strived to provide support and advice on the components of embarking on a career search, e.g. a candidate’s marketability and how to improve the aforementioned. We encourage candidates to keep in touch with us to keep us apprised of their success, whether we have placed them or not. We have just launched our new website riicareer.com, a site whose sole purpose is to assist candidates in every aspect of their career and/or their career search. Such services include: pre or post interview coaching, drafting correspondence and uniquely developed resumes, providing resources and much more; we even offer a Candidate Showcase. Take the time to review our new website and see if we can be of assistance now or in the future. Please note, some parts are still under construction. TIP: Regardless of what stage you are in your career (Entry-Level OR C-Level Executive), ALWAYS be proactive with your career and be ready for any changes that may occur with your employer through no fault of your own. If you want to figure out where you want to go next, first start with an assessment of where you’ve been. Is there a common thread in your career history? Are you using the skills, education, and training you have? If not, why not? Set career goals for yourself. Where do you want to be 1 year, 3 years, and 5 years from now? What must you do you need to get there? Take time to document your work accomplishments. What was the most important thing you did in your job in the last year? What was the impact of that accomplishment — did you save your company money or bring in revenue? Can you quantify the financial impact? Look at your relationships with your co-workers, bosses, and those you supervise. Do you need to make any adjustments? Could you strengthen these relationships? How? Think about what you’d really like your life to be like. If money and time were of no concern to you, how would you spend your days? Identify your #1 personal priority for the next 12 months. What is the one thing you absolutely want to accomplish, or see, or experience in the next year? Professionally, what do you want to be different in the next year? What do you want to be doing more of, and how can you get there? Ask yourself: Am I doing the things I need to do to get where I want to go? Write down what kind of support you need — personally and professionally — to reach the goals you’ve set for yourself. 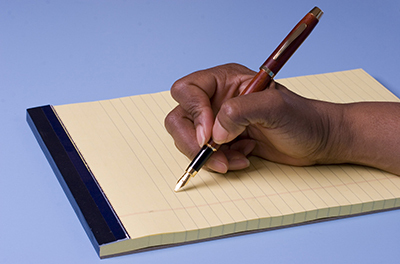 Start an accomplishments journal, brag book, or brag file to document your accomplishments. This may open the door to join Louisiana, New York, Rhode Island, Texas, and Wisconsin that the debtor or lessee needs to be notified at the conclusion of the original term of a contract and give notice to not automatically renew payments. It’s not there yet. 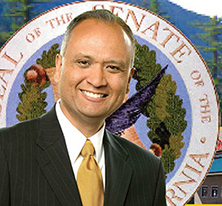 Originally as introduced by California Senator Ed Hernandez (D-Azusa), SB 1428, the bill sought to allow consumers a means by which to cancel services online, targeting automatic renewal contracts and states that if allowed to sign up online, then a similar method of cancellation should be provided to consumers. It has deleted the provision and made it to include any contract that includes automatic renewal. "1702. A business that makes an automatic renewal or continuous service offer that is subject to Article 9 (commencing with Section 17600) of Chapter 1 of Part 3 of Division 7 of the Business and Professions Code shall provide a consumer with an email address or option on the business’ Internet Web site for the consumer to communicate his or her decision to not renew the subscription or purchasing agreement. Within 24 hours of receipt of a consumer’s communication to not renew the subscription or purchasing agreement, the business shall notify the consumer of receipt of the consumer’s communication. The business shall honor the consumer’s decision to not renew. The definitions of “automatic renewal,” “consumer,” and “continuous service” provided in Section 17601 of the Business and Professions Code shall apply to this section." USA Today reports, "The Consumer Financial Protection Bureau (CFPB) is working on a plan that would require providers of payday loans, auto title loans and other small-dollar advances to determine their ability to repay the short-term debts that can have annual interest rates as high as 390%. They have an inquiry into open-ended lines of credits and tactics lenders us to seize wages, vehicles or other personal property from borrowers who miss repayment deadlines." The CFPB recently came down with new guidelines relative to Reg E preauthorized electronic debits of accounts. The term “preauthorized electronic debits” generally means the debiting of an account by a preauthorized written, electronic or verbal authorization, usually for the payment of recurring obligations. It is generated by the customer with an agreement with the customer’s bank. This differs from an ACH in that the ACH is initiated by the creditor’s bank. The new guidelines were promulgated in response to complaint about telemarketers and payday lenders. For banks, not only do the new CFPB regulations apply to you, but to your customers, if you bank loan servicers or payday lenders. Most of us know that to protect our interest in the leased equipment a Lessor needs to file a UCC-1 financing statement in the State where the Lessee has filed their charter papers. The filing of a lien is required under Article 9 of the Uniform Commercial Code (UCC) if you have a “lease that is intended as a security”. This occurs when you fail the legal requirements of Article 2A (Article 10 in California) and are therefore by default covered by Article 9. The big difference between the two articles of law is that Article 9 recognizes the customer as the owner of the equipment and therefore requires the Lessor to file a lien. If your lease fails this definition of an Article 2A lease then your transaction is called a “lease intended as a security” [1-201(37)] and your lessee will be viewed as the owner and you must follow the requirements of Article 9 and file a lien on the equipment. There are three types of liens. 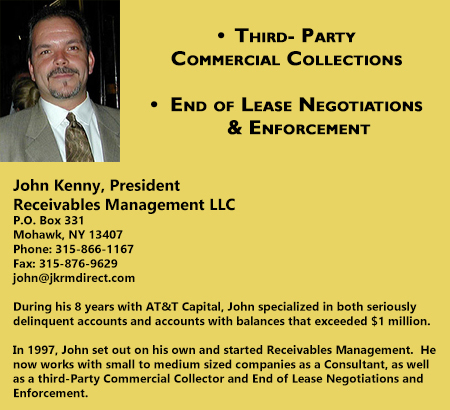 The first one is a lien that is filed on the equipment at any time and no other liens are present on that equipment. The second is the existence of a blanket lien where the lender has a lien everything the lessee owns now plus everything the lessee purchases in the future. The third is when the lender/lessor purchases the equipment for the customer and files a lien called a “purchase money security interest” (PMSI). To be effective and have preference over a blanket lien a PMSI must be filed within 20 days of the lessee’s “taking possession of the first piece of the equipment”. This has accounted for the importance of getting a properly signed and completed delivery/possession certificate or a copy of the bill of laden to show possession date. Way too many Delivery and Acceptance forms fail to request possession date and only have the signature date. This puts into question the possession date and the Lessor does not know if they are late filed. For true legal leases Article 9-505 permits the filing of a precautionary lien on 2A leases. This means that the filing of a lien under Article 9 cannot be used as evidence that the Lessor thought the lease was a loan. The financing statement informs the public that the lessee is in possession of equipment owned by the Lessor and “if” a judge decides the evidence indicates that the transaction is a loan then the Lessor has protected the interest in the equipment by following the rules and filing a lien in the proper manner. As noted earlier, Leasing News Legal Editor Tom McCurnin recommends filing a UCC (1). ANN ARBOR, MI – UniFi Equipment Finance (UniFi) is insuring its portfolio with the American Lease Insurance Agency Corporation (ALI) ProgramSM. UniFi recently updated its leasing software to LeaseTeam’s ASPIRE platform, and sought out ALI to deliver a fully integrated insurance program. The ALI Program, which provides property and liability coverage on eligible financed or leased equipment at competitive “group” rates, is underwritten by Allianz Global Corporate and Specialty® of Chicago, Illinois, rated “A+ “ by A.M. Best. A combination of affordable insurance charges that are fixed for the term of the agreement and better coverage than offered by typical commercial insurance policies has resulted in ALI’s exceptional acceptance rates. Paired with meticulous tracking, the program delivers complete portfolio protection. 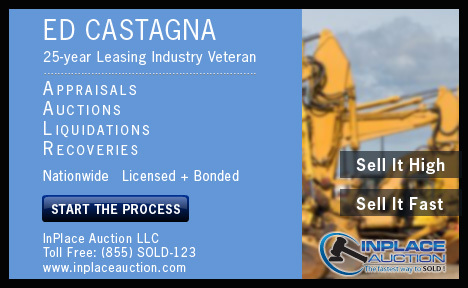 American Lease Insurance Agency Corporation provides comprehensive portfolio protection through the automated American Lease Insurance Program to equipment leasing and financing companies throughout North America. 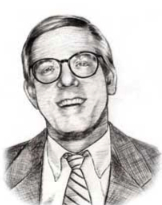 Founded in 2000 by licensed insurance agent and broker Steve Dinkelaker, ALI is headquartered in Sunderland, Massachusetts, and is an active member of all major leasing organizations and the insurance industry’s Association for Cooperative Operations Research and Development (ACORD). American Lease Insurance does business as Lease Insurance International outside the United States. For more information, go to www.aliac.net. UniFi Equipment Finance is a well-established company with a national presence in the small ticket vendor space. UniFi has funded more than 85,000 transactions, totaling over $1 billion. It is an affiliate of the Bank of Ann Arbor, a locally owned and operated bank with total assets and assets under management of over $2 billion. For more information, go to www.unifiedge.com or visit Facebook, Twitter, or LinkedIn. 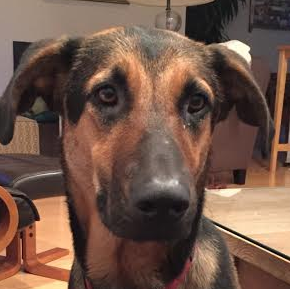 “Meet Ranger- he’s a handsome Doberman shepherd mix who is 2.5 years old. Ranger is loyal and affectionate to his pack. You might find him snoozing on your feet during the day. His absolute favorite thing is chasing balls which he does so with the speed of a race horse. For this reason he’d love a yard to play as much as he can. He’ll sit, shake, lie down and sometimes roll over by command. Right around 5pm he’ll fetch his food bowl and carry it around. 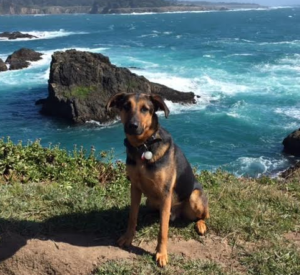 If you run or hike he would be very happy to accompany you since he has tons of energy. He aims to please. “He has an anxious shepherd temperament. He is good with dogs in a controlled environment but he is proactively aggressive with some dogs he meets. At home he becomes protective and needs more help meeting people at the door- He needs a confident and friendly person who can build trust but also be his alpha. Adult home only. He is good with most other dogs with proper intro.